In a middle class Istanbul neighborhood shoppers form a long line to an immense tent carrying a sign that reads "Total combat against inflation." 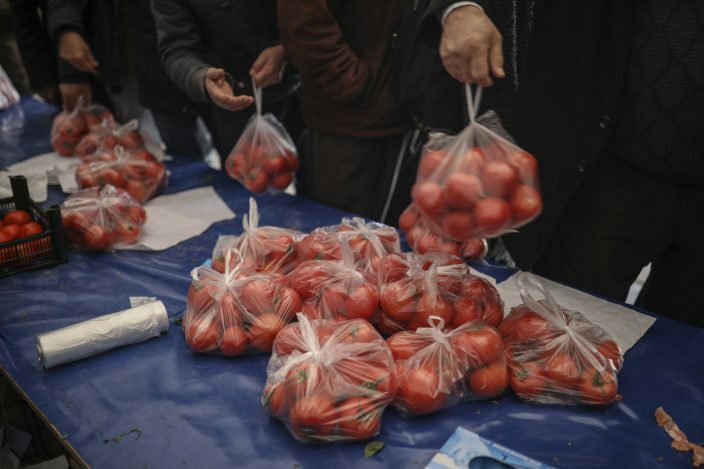 The weapons in that battle: spinach, tomatoes and peppers that the Turkish government is selling in a makeshift stall at almost half the price of the regular markets. 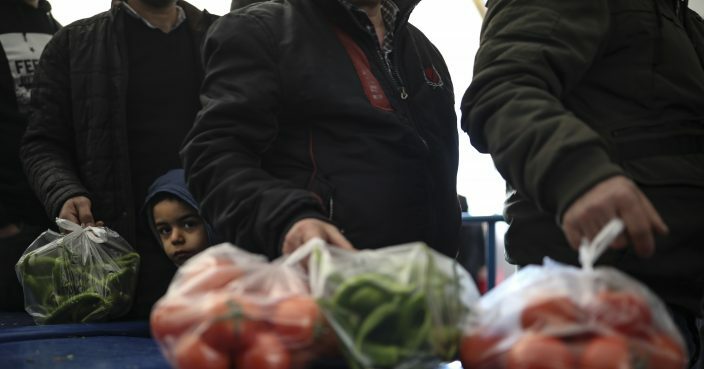 "People who live on minimum wage can't go to the neighborhood bazaar," says Reyhan Kelleci, a 38-year-old homemaker waiting in line who is, like many Turks, struggling with a recent jump in the cost of food and consumer goods. "These regulated tents have been very good for us... What should we do? Should we sit at home and wait for our death?" 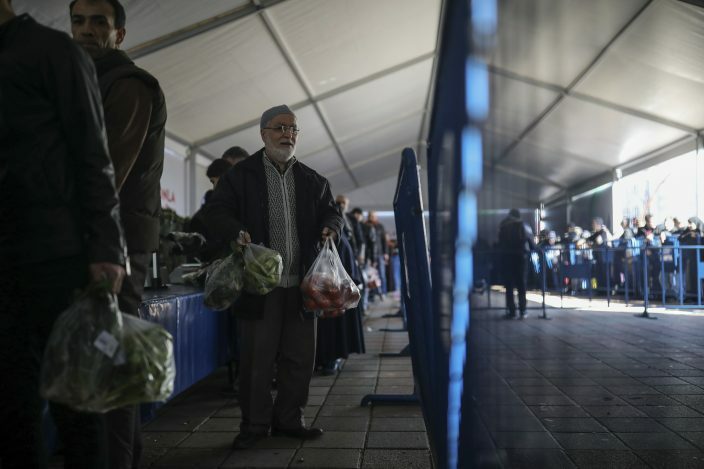 President Recep Tayyip Erdogan's government has set up dozens of these temporary stalls in at least six cities to help families. 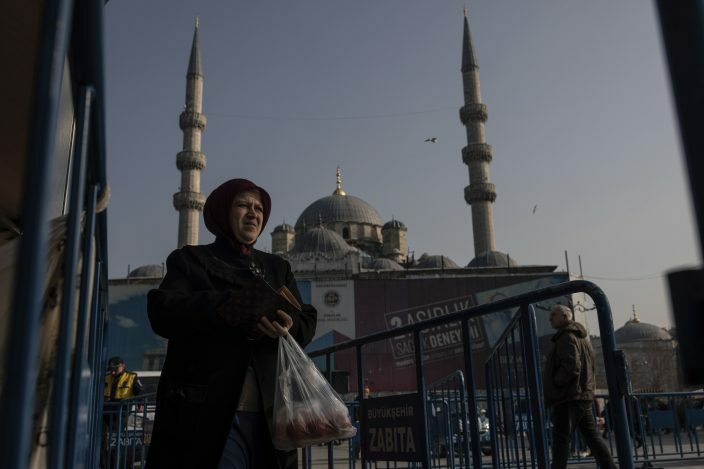 The cost of goods like food has jumped by about a third after turmoil in financial markets last year over Erdogan's policies caused the national currency to slump. 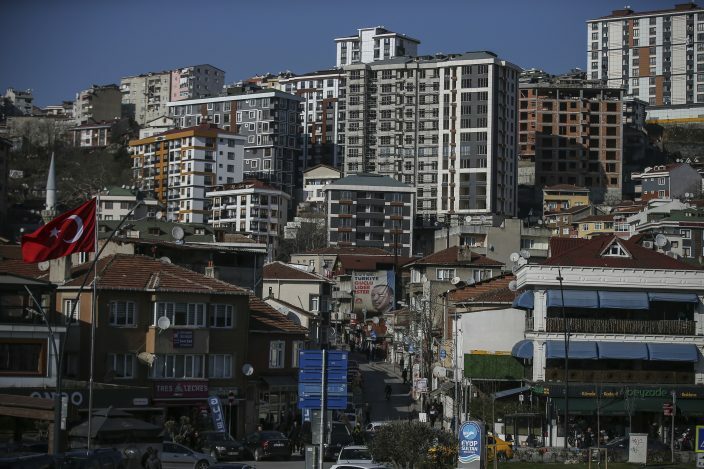 Erdogan faces local elections on March 31, when runaway prices and an economic downturn could cost his ruling party key municipal seats — and his traditional low-income voter base is the most affected by the price increases. In campaign speeches, Erdogan has portrayed the economic downturn as a foreign plot against the country and has vowed to fight food price hikes in the same way that the country has fought terror groups. 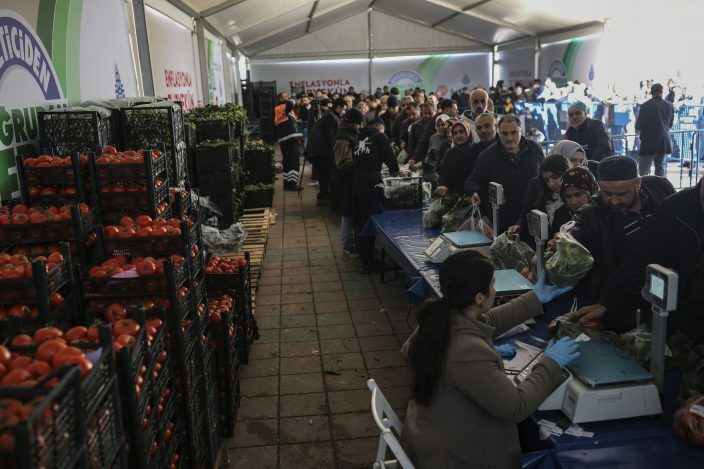 "We have taught, are teaching and will continue to teach a lesson to those who have terrorized through food," Erdogan has said, while promising to increase the numbers of government-run discount markets. While the government blames traders and outsiders, the rise in prices is largely due to the rapid depreciation of the Turkish lira last summer. In August, the lira lost as much as 33 percent of its value against the dollar over a diplomatic spat with the United States. Inflation hovered around 20 percent in January, with food and non-alcoholic beverage prices up 31 percent on the year — a 15-year high. By contrast, inflation for such goods in the United States and Europe has been around 2 percent or less. The currency drop makes imported foods more expensive. But even the foods grown in Turkey are becoming pricier, as the seeds, fertilizers and pesticides used in agriculture are largely imported. Selva Demiralp, professor of economics at Istanbul's Koc University, says the situation is worsened by factors like weather conditions, including floods in southern Turkey, and will be a concern for Erdogan. "Economic factors have a big impact on the election performance of a government and the high inflation and the resulting deterioration in income distribution is not going to help out the government," she said. 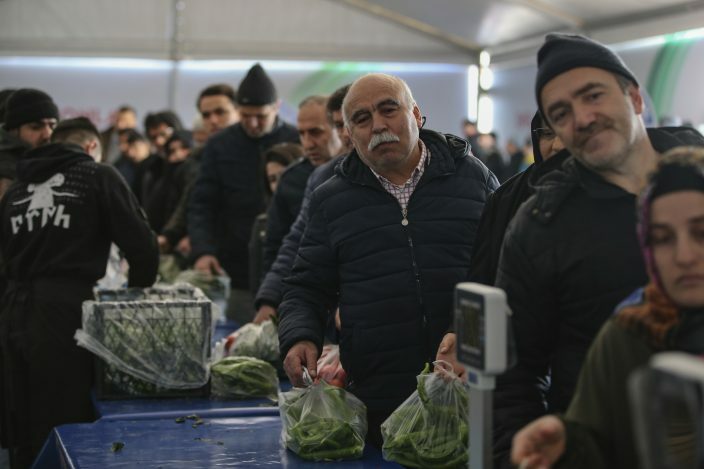 Government authorities this month raided wholesale markets where Trade Minister Ruhsar Pekcan said middlemen were demanding "extortionate" prices. She said the busts revealed an 800 percent increase in prices and announced some 88 companies would be fined. The stalls operated by the government buy produce directly from farmers, eliminating intermediary commissions. 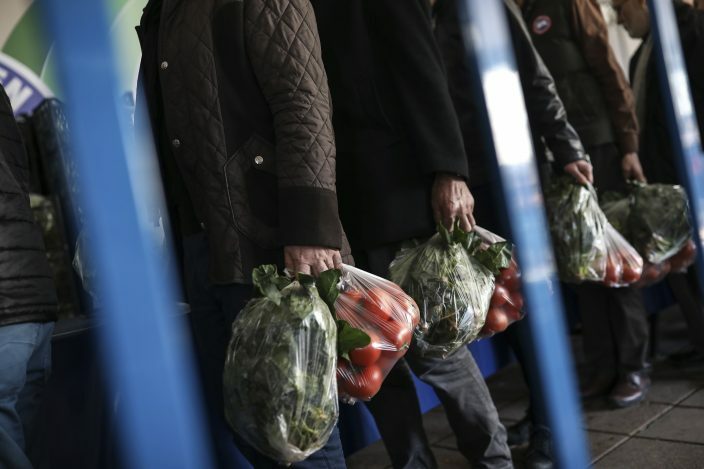 The vegetables on offer are limited and buyers cannot purchase more than 3 kilograms (6.6 pounds) per person. Unlike regular stores, the government markets can avoid many costs. In Istanbul, the ruling party-run municipality moved some workers employed by its catering and hotelier company to the food stalls. It's unclear if the goods are sold at a loss and what effect these sales have on the state budget. The sales could be expanded to include dry legumes, cleaning products and even medicine, officials said. Erdogan said the government markets would continue until the local elections and could become permanent if "opportunists" continue hiking prices. Intermediaries add commissions to the prices of food, but they also have a crucial role in funding farmers, offering storage facilities and organizing sales to wholesalers. Demiralp, the economist, says the government stalls could hurt independent businesses if they are forced to slash their own prices to compete. That is all the more worrying as an increasing number of companies across industries have been declaring bankruptcy. One stall keeper in a bustling weekly bazaar said the government's discount tents were hurting regular sellers. "How can we sell it for that price?" said Yasin Bayer, 33, who arrived at the bazaar before dawn to set up his stall. "We have costs. Opening this counter today costs 1,000, 1,500 liras ($188-282). Labor, bags, gas,"
Still, the discount markets seem to address a public need. Many at the government tents expressed their support for the government's efforts, but others were critical, saying they were an indication of how poorly the economy has been run. Savas Bag, one of the shoppers, said he was having trouble making ends meet and pointed to the long lines: "Isn't this poverty?"